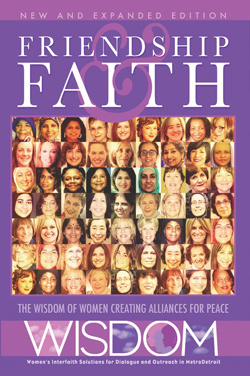 On Sunday, October 8, 2006, women from Christian, Jewish and Muslim faith traditions gathered to learn more about the problem of domestic violence and about each other. The participants met at the Mulberry Square Condominium Clubhouse, and the event became WISDOM’s second initiative to bring together women of different faiths to engage in community service. The WISDOM event was scheduled as part of a national effort to provide an opportunity for women to become familiar with the problem of domestic violence in our nation, and commemorate Domestic Violence Awareness Month. Locally, HAVEN launched the “Weekend of Champions”, with the goal of educating people about the issue of domestic violence and spreading the word about HAVEN’s mission through one hundred private gatherings. The WISDOM participants were asked to sit at tables with other women that they did not know, to give everyone an opportunity to meet, talk, and work with women of different faith traditions. The first part of the afternoon program was spent learning about the problem and the “costs” of domestic violence and providing resource material on HAVEN to all present. Ribbons were distributed, and participants were asked to wear them during the month of October to support the survivors of domestic violence. The afternoon event gave the WISDOM volunteers the opportunity to support HAVEN through their hands-on efforts assembling information packets and items for sale, as well as through monetary donations and the collection of needed items for the women and children staying at the shelter for victims of domestic violence. Over $1,300 was raised during the course of the afternoon. The second half of the afternoon was spent sharing religious traditions. WISDOM women learned about the Jewish celebration of Sukkot and the Muslim celebration of Ramadan. Beth Applebaum spoke about how her family and friends celebrated Sukkot; Dr. Ismat Khan spoke about the five pillars of Islam and the celebration of Ramadan. Questions about prayers, rituals, family traditions, the involvement of children, and special foods followed and many of the women present shared their own experiences. The similarities of the values being celebrated became clear to all. There was a tradition at Sukkot of leaving part of the field unharvested for the poor to harvest for food, similar to the emphasis during Ramadan on sharing with others, especially those less fortunate. Other women commented on the benefit of learning more about their own faith and traditions through their efforts to explain them to women who were unfamiliar with them.